Eleven years ago, Reinke Manufacturing saw a dilemma — the need for skilled labor. Reinke responded with a unique plan of action — work with Deshler Public Schools and businesses to nurture a program that would teach students the basics. We did it our way. We didn’t ask for any help. We just did it,” Deshler superintendent, Al Meier, said. That first year, students built welding booths from drawings provided by Reinke’s. It was the start of a real-world education. “When you can coop a facility like this, it helps everyone,” Roth said. Leading edge equipment, a mill and lathe, waits for students in the Deshler Public Schools metal shop. The equipment was acquired through the Nebraska Developing Youth Talent Initiative grant to Reinke Manufacturing. The grant targets middle school students interested in manufacturing and information technology career exploration programs. Several teachers are involved — Ron Rickstrew and Bonnie Noel, for instance. The school addition built in 1982 holds a variety of intricate lessons, including electric car parts and three new machines, a mill, lathe and robotic, that were purchased with the Nebraska Developing Youth Talent Initiative Grant from Gov. Pete Ricketts. ​Roth said Reinke has 500 employees and it’s an issue to find skilled labor. Students from Thayer Central and Lawrence-Nelson have utilized the shop, which is a dual purpose facility — adult education classes are held in the evenings. For the welding, instruction covers aluminum and steel by American Welding Society standards. Reinke’s also sends their own employee to guide students through projects. “These students can go anywhere in the country to weld once they earn certification,” Roth said. Girls have worked in the shop as well and Meier will never forget the time when three students were offered jobs on the spot right there in the shop. “If you came out to Reinke’s, we have this exact equipment. 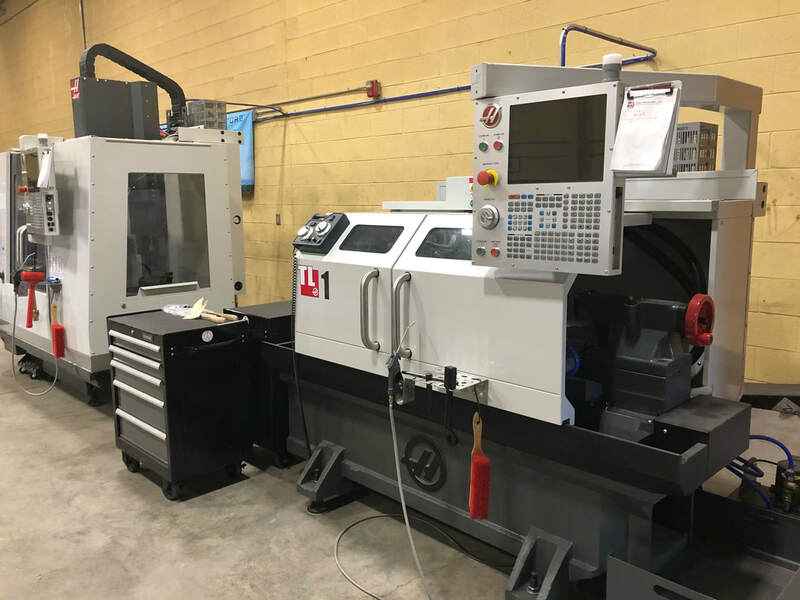 Folks working at Reinke’s are making parts for irrigation systems with these machines,” Roth said about the new mill, lathe and robotic machines. The new equipment arrived in the fall and classes began second semester. Deshler staff and Reinke employees were trained on the equipment that included safety instruction. The machines are primarily for middle school students. “You take the seventh graders and then we build on what they learned for eighth grade. Eventually, we’ll move into the high school as well. It’s here and we might as well use it,” Roth said. Reinke will have a college engineering student interning this summer. Roth said it’s a win for everyone, for Reinke and the community as potential employees make their way back to Thayer County and high paying jobs with full benefits. Reinke Manufacturing has a 10-robot cell that makes parts, which needs highly skilled people to code it, maintain it and troubleshoot. Meier said teachers and a paraeducator are helping projects come to fruition through math, coding the machines and hydraulics. For the program to work, everyone must be on the same page, Roth added. “I really want to commend the school administration and board for doing this for the last 11 years,” he said. He mentioned the Deshler Robotics team that just won state and will compete at nationals in Detroit, Mich.
“It’s very exciting to compete in this century,” Roth said. Sen. Deb Fischer’s staff visited the shop, which splits into two parts, last week. The other side focuses on wood projects. It was a good visit with Fischer’s staff and on that day, Roth was asked where Reinke parts were being shipped to. “On that particular day, we were shipping in Nebraska and to Wyoming, Utah, Oregon, Alberta, Canada, and the country of Romania. Next day, it was completely different,” Roth said. “How great is it when you can develop a program like this with state-of-the-art equipment for kids?” Roth said. ​“We have great neighbors to the west and that’s all there is to it,” Meier said.